with a new, exciting adventure! Did you know that people buy and sell eagle feathers, claws, and parts? Cooper and Packrat didn’t, either. But they’re learning fast. 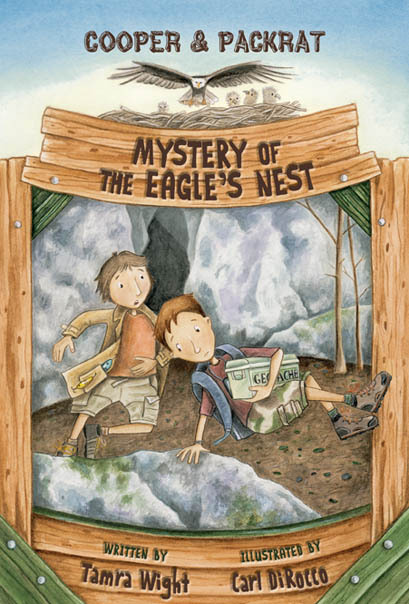 When the boys find a box of valuable eagle parts, they soon realize that the owner will stop at nothing to get them back, in this fast-paced middle-grade mystery from Tamra Wight. Trouble has returned to Wilder Family Campground. When Cooper and Packrat find their geo-cache box full of illegal eagle parts, their lazy summer is over. Someone wants those valuable parts back. And if they can’t get the parts back, they’ll settle for holding one of the rare Pine Lake eaglets hostage instead. Cooper, Packrat, and Roy must elude two goons, tolerate an annoying teenager, keep tabs on a shady new camper, and stake out the eagle’s nest — all without getting grounded. Tamra Wight has written an exciting follow-up to “Mystery on Pine Lake,” ripe with adventure and natural history, but above all, a tale of compassion and friendship.